The powerful tools behind our solutions! Take SharePoint beyond its basic capabilities with SP Applications Services tools. Unlike other applications that have coded layers on top of SharePoint, SP Marketplace has designed its portals and applications to retain the flexibility of standard SharePoint while delivering enhanced functionality through the tools. All SP Smart Tools are designed to be used by administrators who possess business power user skills. 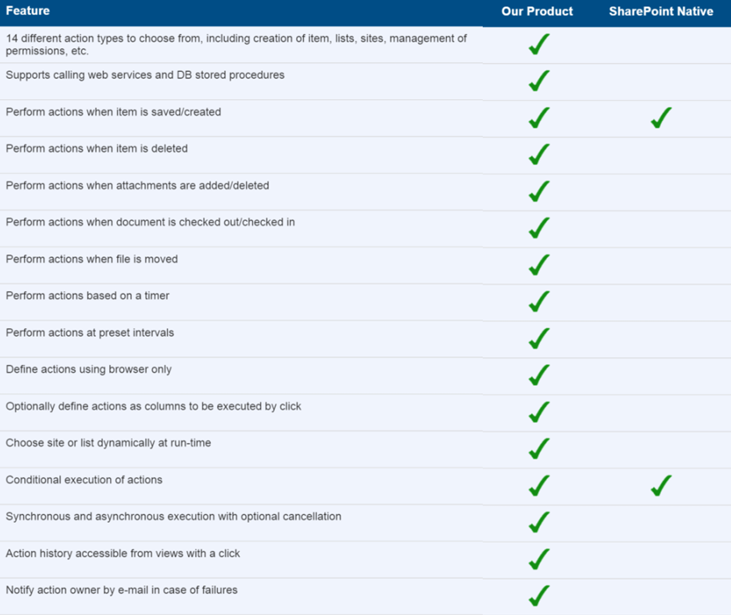 The SP Smart Tools take SP Marketplace products beyond basic SharePoint site templates to complete operational portals. They are available for you to use to customize or add to our out-of-the-box solutions! Dynamic Forms for SharePoint (DFFS) lets your customize out-of-the-box SharePoint forms to create powerful rich and dynamic forms without using code. SP Marketplace uses DFFS in all its operational portals to extend standard list forms to create a more interactive experience for the user. It also allows us to deliver forms that deliver an intuitive design for different roles in your business and allows us to handle more complex processes. By using the graphical user interface, you can customize the layout using headings or custom HTML, tool tips, tabs, or accordions. Arrange form fields side by side and add triggers and rules to control which fields are visible, hidden, read-only, or required. You can also show different form fields or tabs for different users by targeting SharePoint user groups. The vLookup feature lets you create relationships between two or more lists and libraries and expose the related items as part of your form. This feature allows SP Marketplace to provide SuperView forms where, from a single form, a user can access all related items, documents, and tasks, eliminating the need to go from one list to another. 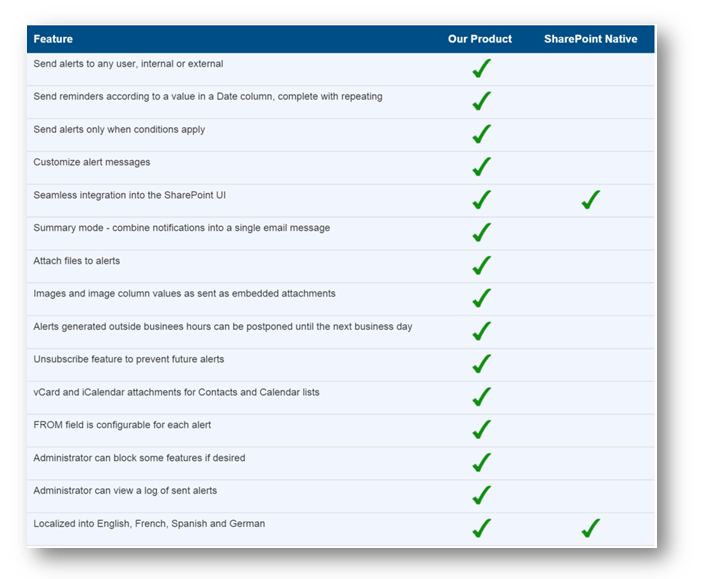 Take SharePoint alerts to the next level using Smart Alert Pro, which includes conditions, timed notifications, user-defined email templates, and much more. Define precisely what notifications you wish to receive and when, without flooding your email inbox with unwanted, redundant messages. Smart Alert Pro is part of the SP Business Suite subscription and is developed by Infowise Solutions. The enhanced email notification tool allows business users to define notifications without using workflows, and avoids the no-reply issue with SharePoint notifications. SP Business Suite uses Smart Alert Pro in all of its operational portals for notifications using email for confirmations, overdue reminders, escalations, sales followup, assignment notifications and much more. Smart Action Pro allows you to implement advanced solutions previously only feasible using workflows. Now you can define and execute 14 different types of actions, from updating list items or external databases to creating sites and managing permissions. SP Business Suite uses Smart Action Pro in all of its operational portals for a variety of tasks including approvals, email correspondence for support and sales, moving documents, setting status, and more. Actions are then executed automatically, manually, or at a predefined time. Instead of writing code-based workflows or custom event receivers using Visual Studio, you accomplish what you need in minutes using just a browser. Smart Alert Pro is part of the SP Business Suite subscription and is developed by Infowise Solutions. Smart Import Pro lets you automatically import emails and database items into any SharePoint list or library to generate or update list items or documents. When you want to initiate a business process based on information received from an email or from a business application, just enter that information into a SharePoint list first. With Smart Import Pro, you can define the import profile using just your browser. Create a new profile, set up a schedule, point it to a mail account or a database, and designate a course of action for incoming data. Determine the method in which to create new items or update existing items. You can even extract the ID of an item to update from any text field, such as email subject line. Incoming email is not possible with SharePoint Online and the incoming email feature with SharePoint on-premise is cumbersome, limited, and will only work with document libraries and discussion boards. Importing data from databases requires external tools or custom development. Smart Alert Pro is part of the SP Business Suite subscription and is developed by Infowise Solutions.